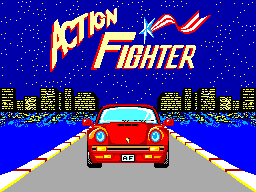 Ah yes, ye old Action fighter, this was a game that was very common in the UK and everyone seemed to have a copy, you couldn't swap Action fighter with your mates, because the all had it! 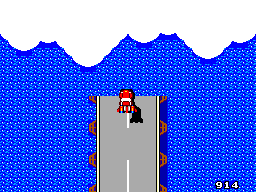 The game was part of Sega's early budget release titles along with the Ninja, Pro Wrestling and Fantasy Zone. I remember buying this for £9.99 from Index the catalogue shop and man I sure was impressed, I sat glued to this game for hours upon end. The game is a basic top-down scrolling shooter, but this game has some real style and charisma for me. The fact that you not only have a top-down driving game here, but also a top-down flying/shooter game in one is quite unique. I don't think I have seen this repeated in any games since the release of Action fighter. Sadly it also seems to be a game that everyone takes for granted due to how common it is/was. The story for the game (as if it needed one) is that you are working for some secret government agency, the president has given you missions to attack his enemies, there’s all different sorts, such as submarines, helicopters and tanks etc. The graphics in the game have the usual "Mega cartridge" look, things are not too detailed but everything is designed to be functional and runs very smoothly without slow-down even with many enemies on the screen at once. 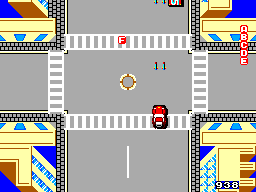 I find the ground levels to be very easy on the eyes, the road markings also help give the illusion of great speed and this helps the pace of the game as it feels a whole lot faster and more exciting. The boss characters a little bit of a let down though it does have to be said, doesn't seem like a great deal of thought went into producing unique graphics. There are two main music tracks in the game which you will be hearing all the time, the car sound track is quite good, but the frequency of which you hear it eventually makes you sick of it. A little variety would have been much better. The flying level music is also quite good, but equally repetitive and drags on a little bit making the air levels seem to go slower. I was quite happy with the sound effects for the guns and explosions. The best sound effect is when changing from motorcycle to car by pressing both buttons together, you will get a satisfying "clash" and this will be followed by the sound of your high powered engine. Controls are easy to learn and respond nicely to your commands, the game suffers from button bashing syndrome though like many other shooters. You really do need to use a rapid fire unit for extended play of this game, failure to do this may result in your fingers falling off! You have been warned! There is also a cool trick you can use while driving as the car; if you press both buttons simultaneously your car instantly reaches its top speed, very useful when you need to get out of a tight spot, or just cant escape the helicopters overhead. I always come back to this game whenever i feel like a quick blast, this along with Astro Warrior are my two favourite top-down shooters, the game just has that "pick up and play" feel that is guaranteed to keep you coming back for more. Action fighter is a definite must-have for all fans of top-down shooters, I recommend strongly that if there is any SMS fans out there that don’t have a copy of this game that they pick one up, despite the dodgy packaging (which is of a motorcycle rear-view mirror and not a magnifying glass which people seem to think it is!) the game will keep you entertained for hours, and is just great fun!